The post Six Senses Bhutan Opens in The Land of The Thunder Dragon appeared first on Lookeast Magazine. The post So Amazing Chefs Announced Dates for this Year’s 8-Day Culinary Experience appeared first on Lookeast Magazine. The 2019 list features 10 new restaurants, including two first-time entries from Thailand: Sorn (No.48) and Gaa, making its debut on the list at No.16. Gaa has double reason to celebrate. As well as claiming the Highest New Entry Award, executive chef Garima Arora is named elit Vodka Asia’s Best Female Chef 2019. The 2019 list reflects the diversity and vitality of the ever-evolving Asian gastronomic scene, featuring 10 new restaurants, including a first-time entry from Malaysia (Dewakan, No.46) and a new restaurant in the Philippines (Toyo Eatery, No.43), a country last represented in the list in 2017Host destination Macao counts two restaurants with Jade Dragon rising eight places to No.27 and Wing Lei Palace debuting at No.36. The post Thailand Secures Eight Entries On 2019 List Of Asia’s 50 Best Restaurants appeared first on Lookeast Magazine. The post Don’t Be Coy, Come to Koi appeared first on Lookeast Magazine. The St. Regis Bangkok launched on March 15 a limited edition afternoon tea named “Old New York – Modern Bangkok,” an interesting fusion curated by the hotel’s executive chef Christopher Miller and the celebrated Thai Fashion designer Tawn “C” Chatchavalvong. The complete afternoon tea experience has been inspired by the glamorous legacy of the first St. Regis in old New York, and an elegant modern Bangkok. Afternoon tea is served at the Drawing Room on the 12th floor, where you can enjoy the spectacular view of Royal Bangkok Sports Club while sipping your perfectly brewed cup of TWG tea or coffee, indulging in delightful delicacies from Thailand and the world. 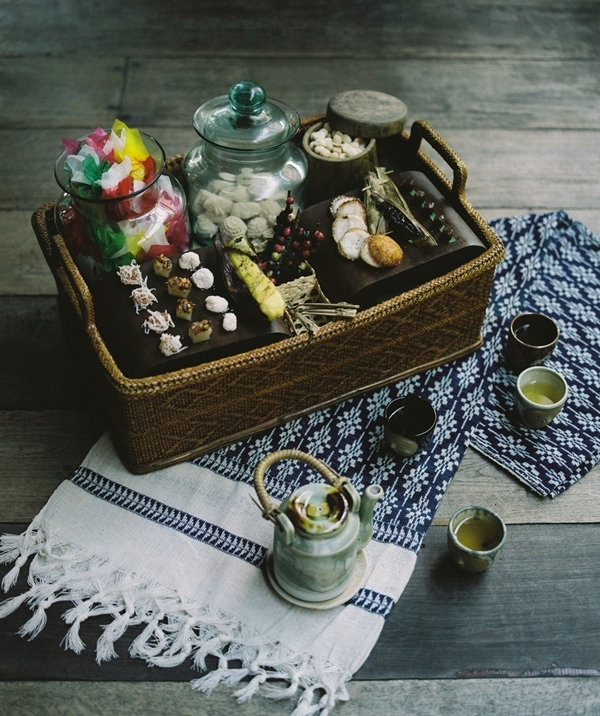 All the items served in the spread speak of the efforts put in by the chef and designer in curating an amazing tea set. To begin, sparkling tomato essence is served with caprese on a stick, accompanied with caviar, sour cream, and chives in a waffle cone. While some of the items were authentic dishes from American cuisine—like smoked salmon and cream cheese bagel and the delicious New York cheesecake, which was one of the best I’ve ever had!—some of the treats were given an exciting angle by fusing traditional Thai with American cuisine. Shrimp with Thai paste served on rye bread. But no afternoon tea tradition is complete without scones. We were served some with clotted cream and yummy jams to accompany a perfectly brewed cup of TWG tea. What makes this afternoon tea experience different, in a good way, is that the savory delicacies are given as much attention as the sweet treats, and both are as good in number. Considerations were given not just to the food but also to its plating. Inspired by skylines of old Manhattan and the Thai capital, Tawn C himself designed a special tower-shaped tea stand to serve the scrumptious spread. Go check it out before it’s too late. How much: THB 1,900++ per set for two people, including tea and coffee; THB 2,100++ per set for two people, including two cocktails additionally. The post Old New York – Modern Bangkok: A Limited Edition Afternoon Tea Ritual at The St. Regis Bangkok appeared first on Lookeast Magazine. The post A Model Market for Others to Aspire To appeared first on Lookeast Magazine. NokScoot, the joint venture low-cost carrier of Thailand’s Nok Air and Singapore’s Scoot, celebrated its first flight to Shanghai when it touched down early on February 26, 2019, at Pudong International Airport after departing from Bangkok’s Don Mueang International Airport. Passengers on flight XW858 were warmly welcomed in Bangkok upon check-in with colorful paper lantern and a mock-up of Shanghai’s skyline where passengers could take photos. NokScoot is initially operating four weekly flights from Bangkok to Shanghai, with flight frequency becoming daily from March 4, 2019. This new service is part of NokScoot’s commitment to growing its footprint in China. Shanghai is China’s commercial capital that never sleeps. It grew in the 19th century and flourished to become a center of commerce and global finance during its heyday in the 1930s. It is renowned for its Lujiazui skyline, museums and historic colonial architecture. The Bund is Shanghai’s most famous attraction and home the city’s most respected businesses, loved restaurants, and famous clubs. Nearby is the bustling shopping enclave on Nanjing Road, plus the City God Temple, Yu Garden, and the landmark Oriental Pearl Tower across the in Pudong. NokScoot uses Boeing 777-200 wide-bodied twin-aisle jets, configured with a total of 415 seats, on all flights to and from its hub at Bangkok’s Don Muang International Airport. The aircraft is bigger than those traditionally used by low-cost carriers and offers an unprecedented level of comfort, with 24 seats in Business Class and 391 seats in Economy, supported by great fares for its customers. NokScoot also operates regular flights to Nanjing, Qingdao, Shenyang, Tianjin and, X’ian in China, Narita and Osaka in Japan, New Delhi in India and Taipei. Flights to India, Japan, and South Korea are more likely to follow in the future. To celebrate its new Bangkok to Shanghai flights, NokScoot is offering promotional one-way Economy FLY fares starting from THB 999, inclusive of tax and fuel surcharge, from Bangkok to Shanghai for travel from now to March 30, 2019. The promotion can be purchased on www.nokscoot.com from February25–28, 2019. Terms and conditions apply. The post NokScoot’s First Shanghai Flight Touches Down in Pudong appeared first on Lookeast Magazine. With open and active clubs in Lumphini, K Village, Pakkred, Nanglinchee Market Place Mall, and their most recent opening at Amarin Plaza (watch a video here), Anytime Fitness is on the rise to expand quickly in Thailand, starting in Bangkok. The fitness chain’s business model for their gyms offers a no-frills experience to its members: all the necessary equipment and assistance, as well as free group classes, are offered in a 24/7 format at affordable prices. “We want to be accessible to anyone, anywhere, anytime,” said Anytime Fitness affiliate, Billy Pech. “The fitness industry in Thailand is leveled in a way where all fitness brands look and offer the same thing. Anytime Fitness is here to offer a different kind of experience with our surprisingly personable people,” he added. While Bangkok is on steady growth, expansion outside the city is also likely in the future. Like the neighboring countries under Anytime Fitness Asia, it is a goal to expand all throughout the country especially in places most big-box gyms are not expected to open, they ascertain. Founded in 2002, it took Anytime Fitness just 16 years to reach 4,000 gyms around the world. According to FRANData, the chain is just one of 15 franchisors located in 30 or more countries. The first Anytime Fitness in Thailand opened in Bangkok in 2017, with a view to expanding its Asian footprint. Since then, over 500 gyms have opened throughout the region, which is expected to double in number by 2020. A new design was launched in Amarin Plaza, and all future clubs in Thailand will carry the new design to usher in a new era for the brand. One of the benefits of an Anytime Fitness membership is the franchise’s “Anywhere Access” policy: Join one Anytime Fitness gym and you can use any of the chain’s more than 4,000 gyms worldwide at no additional cost. This gives members the option of exercising not only whenever they choose (Anytime Fitness gyms are open 24/7/365), but virtually wherever they like. And with gyms in all 50 states in the U.S. and more than 30 countries and regions, the “Anywhere Access” policy can be a real cost-saver – especially for frequent travelers. The post Anytime Fitness Continues Expanding in Thailand appeared first on Lookeast Magazine. In addition to previously announced artists including Goldie and the Ensemble, Nightmares on Wax, Huun Huur Tu, Craig Richards, Margaret Dygas, Job2do, Sirintip, Mathew Jonson (Live), Young Marco, Nicolas Lutz, Sóley, Costlywood and Knower, the final phase is further expanded with more unique and cross-cultural artists spanning the music spectrum. Prepare to experience different techno rhythms by the marching band MEUTE and experimental artist Kangding Ray while embarking on a new electronic adventure with Boy Bjorn, Crussen (Live) and Stavroz (Live). Witness a variety of cross-cultural music by Alena Murang, DuOuD and Mammal Hands. Added to this extensive list, more music styles prepared for Wonderers to discover are those from Alligatorz, Two Pills After Meal, and Weep Show with Borgar & Howie B. In a first-time collaboration with the Waldorf Project, a well-known group of artists who offer a radical immersive experience through all senses, an experiment in empathy engineering will be attempted. 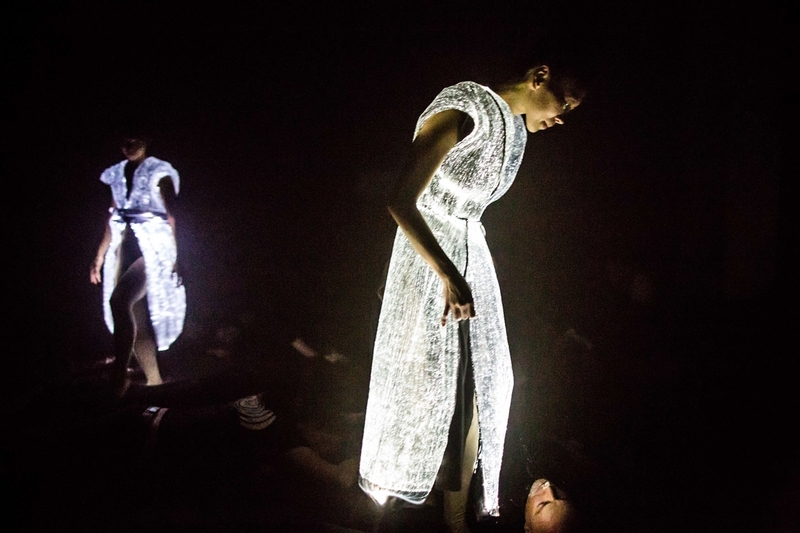 Following an impressive FUTURO performance in London, where, on a small scale, they proved that empathy can be engineered through a creative transformation of senses, this time around they will attempt it with a festival-wide audience. The performance includes 250 dancers from the Bangkok Dance Academy, alongside the UK’s core team. Artificial Intelligence will also take a fundamental role as the ‘third choreographer’ passing empathy through body movements and making the impossible possible. 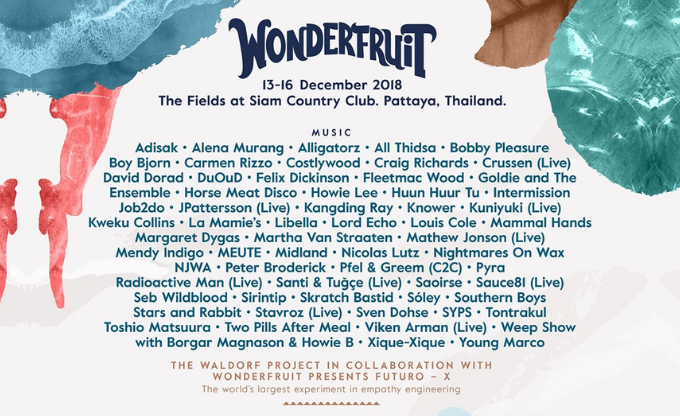 The masterminds behind the Waldorf Project, including artist Sean Rogg, have been working closely with the Wonderfruit team for over six months on “FUTURO-X”. This is a truly revolutionary concept, both for the Waldorf Project itself and Wonderfruit. The Theatre of Feasts returns this year with a range of Feasts (prior reservation required) created by prestigious and innovative chefs from different parts of the world. Among them are one-starred Michelin restaurant Bo.lan by Chef Bo — Duangporn Songivsava and Chef Dylan Jones, serving well-balanced and unique Thai dishes, as well as Chef Chalee Kader (100 Mahaseth), Chef Prin Polsuk (Samrub for Thai) and Chef Num Triyasenawat (Samuay & Sons) who will showcase Thai street food with an array of grilled meat-on-sticks dishes to dip in Nam phrik (or Thai relishes), while Chef Garima Arora of Gaa will let Wonderers explore her extraordinary and innovative dinner feast. 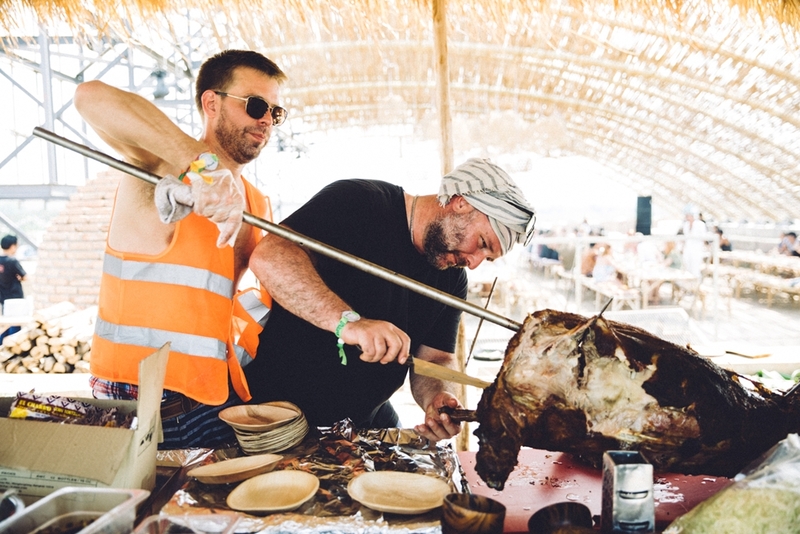 Chef Paolo Vitaletti (Appia and Peppina), Chef Jarrett Wrisley (Appia and Soul Food Mahanakorn) & The Guest List will also be in The Fields, allowing Wonderers to experience their dishes, created with a sustainable approach, for Sunday’s late lunch. Offering an interactive culinary experience that goes beyond a meal, Wonder Kitchen debuts this year by giving Wonderers an opportunity to closely witness a chef’s kitchen theatrics as they prepare their dishes. They have the option to learn even more by joining their master classes and cooking workshops. The Wonder Kitchen will see feasts prepared by Chef Black — Phanuphon Bulsuwan, who will showcase Eastern Thai cuisine with locally sourced products. Chef Ik – Bunn Boriboon will team up with Takashi Hirasawa, founder of Lacto-Life, to host a probiotic workshop, where participants will learn more about the healthy bacteria, and how to include them in their daily meals. Thailand’s Top Chef Chef Tam — Chudaree Debhakam will also host a workshop and a dinner at Wonder Kitchen. Mark Lloyd, who holds two Guinness Book of World Records awards, will introduce a zero-waste bar and workshops on making cocktails from food scraps. Launched for the first time in Asia, Polygon Live features underground house and techno DJs and live performers amidst the polygonal bamboo structure using 3D virtual-reality sound technology from L-Acoustics. One of the most sought-after destinations for dance music lovers will be filled with an immersive lineup, including Santi & Tuğçe (Live), JPatterson (Live), David Dorad, Viken Arman (Live), Martha Van Straaten and Xique-Xique. This year, Wonderfruit will bring SOT back to The Fields. Running 24 hours a day, the urban venue will be flooded with Bangkok’s top curators in music, food, and drinks. Prepare to indulge in an eclectic mix of music by international DJs from 4-time DMC champions Pfel & Greem (C2C) to Chicago rapper Kweku Collins, joined by many more local established acts. A newcomer to The Fields, The Hamlet is a cozy theatre-in-the-round, packed with entertainment, food and drink among comfy cushions and a collage of tie-dyed fabrics. Wonderfruit’s perfect sanctuary to restore your mind, body and soul, Wonder Garden, returns this year with the theme of Axis Mundi, or ‘the world’s center’. It aims to create powerful experiences and allow Wonderers to connect with the universal power through an array of activities, ranging from Chakra Kitchen, a dining experience for those searching for self-rearrangement through Ayurveda, to self-mastery sessions, The Art of Soul Gazing, an ice bath detox with Cryotherapy, a mat-free, laughter-filled Yoga session called Laughter Yoga, the return of gong baths, plus Amazonian Medicine Healing, sacred water ceremonies, 5 Masters: Crystal Bowl Meditative Ceremony and much more. 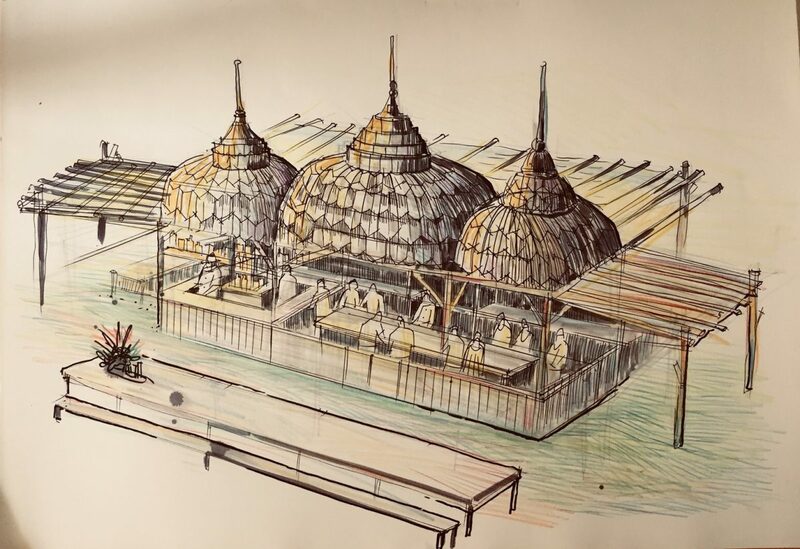 This year Scratch Talks returns, under its new home of the Eco Pavilion, with a lineup of diverse speakers aimed at encouraging innovation and collaboration. The program will feature a series of thought-provoking conversations on topics such as Radical Healthspan Extension by Dr. Molly Maloof, The Sampran Model Organic Farmers Project in Thailand by Arrut Navaraj, Zero Waste Solutions, and Plastic Pollution by Sonia S. Mendoza, Nice Ad, Shame about the Planet by Naresh Ramchandani and many more. Additionally, Wonderers can expect a range of experiences that encourage exploration, creativity, and sustainable initiatives. Starting with the Thai Pavilion by the Tourism Authority of Thailand (TAT), where they can explore snippets of authentic Thai culture and local destinations, to the Tuk Tuk Bar, a modification of the landmark bus, which offers a varied choice of world-class cocktails from bartenders handpicked by Johnnie Walker. The Moon Shack by Sangsom brings back the golden days of vinyl records, while those looking to chill out can lounge in The Ziggurat – a multilevel sanctuary for beer enthusiasts by Singha. 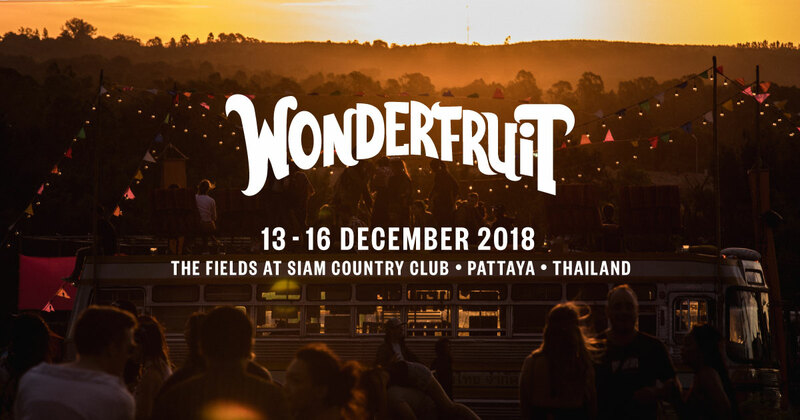 More info: Visit Wonderfruit’s website for more information on securing your tickets, travel, and accommodation. The post Wonderfruit Counts Down to Its 5th Celebration appeared first on Lookeast Magazine. With the consolidation of Hotel 81, Value Hotel, Venue Hotel, V Hotel, Hotel Boss, and Hotel Mi under one umbrella, Worldwide Hotels announced it became Singapore’s largest homegrown tourist class hotel group. In Singapore, Worldwide Hotels owns and manages all of its properties there spanning 38 properties and over 6,500 rooms, across the six brands. Beyond its home ground, Worldwide Hotels continues to expand its presence and has acquired properties around the world. With the first hotel established in 1993 by Group Chairman Choo Chong Ngen, Worldwide Hotels has been steadily growing its portfolio and is rapidly expanding overseas with over eight properties around Asia-Pacific. More developments are in the pipeline as the Group continues to grow its footprint at home and beyond. 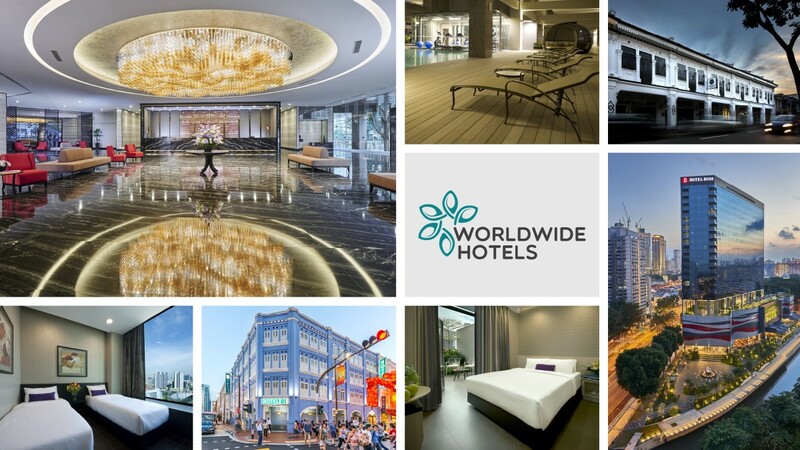 Worldwide Hotels celebrated its launch in conjunction with the group’s 25th anniversary in October 2018. The post Singapore’s Worldwide Hotels Celebrated Its 25th Anniversary appeared first on Lookeast Magazine.